Refugees from the "1000-year flood" of the Mississippi River in 1937. In February 2010, the U.S. official unemployment rate was 9.8%. The word "unemployment" doesn't appear in the 50-page IAWG report on the social cost of carbon. Nor do the words "recession," "jobs," "poverty" or "inequality" The word "labor" occurs several times but only in the context of an arcane footnote about "a method of estimating η using data on labor supply behavior." 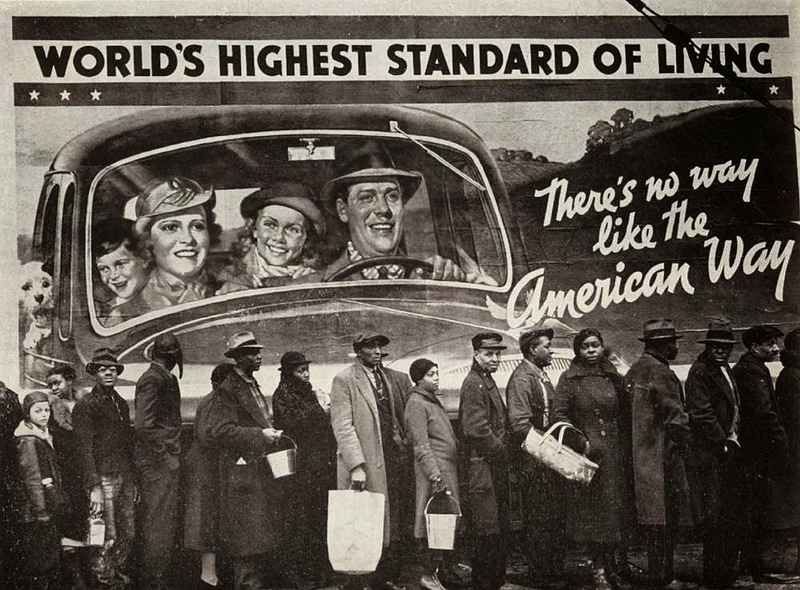 The "lives and social security of people" is given short shrift. "Growth," however, appears 34 times, about two-thirds of which refer to economic growth. In the IAWG report, one may conclude, economic growth is unrelated to employment of labor but closely correlated with "interest rate," which appears 20 times -- roughly the same frequency as "growth" in the economic context.. In 1950, the same year the Green Book was curbing the use of secondary benefits in cost benefit analysis, Karl William Kapp's book The Social Cost of Private Enterprise was published, inspired by and elaborating on J. M. Clark's analysis of cost shifting. "As Kapp implied," remarked Joan Martinez-Alier, "from a business point of view, externalities are not so much market failures as cost-shifting successes." From that perspective, the IAWG's $21 a ton estimate of the social cost of carbon dioxide also may be better understood as an agenda-shifting success rather than a planning failure. Eighty years ago, it may still have been possible to believe that those cost-shifting successes of business could be remedied through planning and public works conducted by a democratically-responsive government. 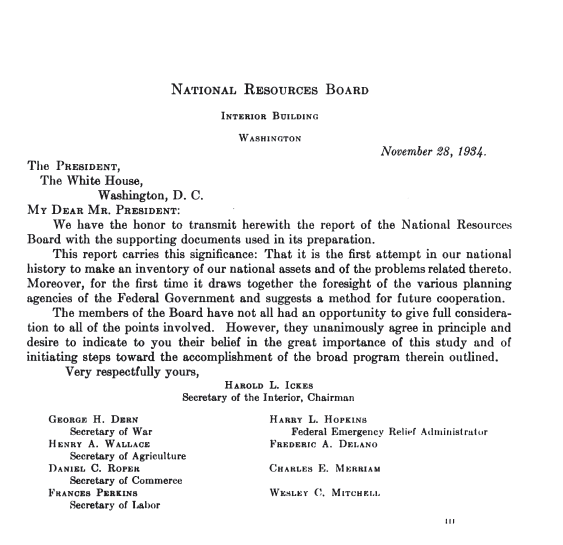 Today, the role of government and the intention of cost benefit analysis is very different from what was professed in the foreword to the National Resources Board's 1934 report. How has that happened? "Many difficult conceptual issues such as externalities, consumer surplus, opportunity costs, and secondary benefits that had troubled earlier practitioners were resolved and other unresolved issues, such as the discount rate, were at least clarified." -- Maynard M. Hufschmidt, "Benefit-Cost Analysis 1933-1985"
Just what are those "secondary benefits"? What are the "opportunity costs"? How did the difficult issues get resolved? And who cares? What if I told you that "secondary benefits" was a cipher for "wages of labor," that "opportunity costs" was code for "return on capital investment" and that a significant portion of those supposedly sacrosanct financial "opportunities" result from cost-shifting? What if I pointed out that the "difficult issues" were "resolved" by declaring that wages were of little concern to public policy making but that profits were paramount? "It comes down to this, that any use of labor that is worth anything at all is worth that much more than nothing. In that respect the socialist view of business depressions is correct and any rebuttal that attempts to explain away this fact by the reckonings of financial expenses is a bit of economic sophistry." Studies in the Economics of Overhead Costs (1923). this was the point of Circular A-47, which was to unify the assorted plans of the water-related agencies; therefore it had to weigh discount rates. it should be observed that in any case the federal government largely ignored A-47 until the civil rights movement reignited the legitimacy of contesting the principle of federal water resource infrastructure, and the process of public consultation caused the length of planning-permission procedures to explode. Do the practitioners know about the embedded choices? One gets the feeling that it is possible to obtain a PhD and not know. It's like never traveling to a foreign country: you'd never know that much of what we consider "normal" is actually uniquely (bizarrely) American. W. Never visited a foreign country (other than Tiajuana). A couple of quick points, S-man. First, the distinction between micro and macro analysis of public projects is tricky. Yes, if a project generates employment and increases incomes in the context of an output gap, that needs to be considered. OTOH, to apply that analysis to a single project implies that the public budget is perfectly flexible: if the project is not undertaken that much less money will be spent. But if you had a fixed budget, the size of the budget would be the relevant macro variable and you could ignore macro impacts at the project level. In the real world we're usually somewhere in the middle, right? Incidentally, there has been a big move in developing countries toward the adoption of employment-generating public programs, the biggest being India's National Rural Employment Guarantee. Second, the Ramsey equation for a supposedly ideal discount rate assumes, as you point out, perpetual growth. It is not unreasonable to suppose that climate change could cause a substantial reduction in economic welfare, however, as it kicks into high gear. In that case, Ramsey would have us use a negative discount rate: future costs would count for more today because future people would have lower incomes and a higher marginal utility of money. Personally, I'm not persuaded by Ramsey overall, so I don't get stressed out by this reversal. It's an interesting argument though. "In the real world we're usually somewhere in the middle, right?" In what sense could a global climate-economy assessment model be rationalized as "microeconomic"? What I'm trying to convey here is that the conventional cost-benefit analysis at the core of DICEy IAMs is a hybrid whose parts don't add up to a coherent whole, and certainly not one relevant to the issues it is called upon to address. The extent to which public budgets are flexible is an empirical question that economics should have a very well known answer to. It's as if in chemistry somebody said, "Water boils around 200 degrees, right?" "Personally, I'm not pursueded by Ramsey overall"
is a very roundabout way of claiming to know how humans will react to climate change for the next 50 years. Thanks, Greg, Looks very interesting indeed! "Project Appraisal for the Keynesian Investment Planner"
"Although simple, this is not an intuitively obvious argument, so Ellerman illustrates it with a very simple example in which John values apples at one dollar each, while Mary values them at 50 cents. Social wealth would be improved if Mary sells an apple to John for 75 cents. Under the Kaldor-Hicks criterion, social wealth would also be improved if Mary lost her apple and John found it, even though Mary receives no compensation. Kaldor-Hicks would deem this an efficiency gain because John could potentially compensate Mary by paying her 75 cents for the lost apple. Measured in apples, though, there has been no change in total wealth because Mary's lost apple exactly balances John found one..
"But using apples as the unit of measurement changes everything. Since John values one apple at one dollar, he also values one dollar at one apple. Mary values a dollar at two apples.Measured in apples, social wealth would be improved if John lost a dollar -- worth only one apple to him -- and Mary, who values the dollar at two apples, found it. John's cost is smaller -- in apples -- than Mary's benefit. But since a dollar is a dollar, if the unit of measurement was dollars, the cost and the benefit would exactly balance leaving no net gain." I don't get this. I would think that the price of apples would play a role here. How does this work our if the market price of apples is 25 cents? What am I missing? Ellerman is not talking about market prices but about preferences for one good in terms of another good (including money as a good). John and Mary have difference preferences for apples relative to money.